Under brooding clouds one day in June 2007, a friend and I visited the Basilique du Sacré-Coeur de Montmartre in Paris, perched on a small hill overlooking numerous tourist shops, hawkers, musicians, hotdogs for homesick Americans, and couples kissing each other. It is a visually stunning church that is utterly different to the Notre Dame de Paris. Dignified and quiet, nuns and priests gather for wide-ranging reflection on God and the divine life. Such solemnity precludes practically everything one may want to do in a sacred space: talk, take a photograph, drink a drink, and eat a hamburger. This, at least, is what the signs at the entrance explicitly banned. There were two big African guys enforcing the regulations. They kicked out a couple of fat drunken pink-faced tourists in pastel shirts who made a mockery of the rules by taking a photo. Within moments of their small camera's flash lighting up the cavernous interior, the two enforcers descended on them and firmly escorted them to the exit. 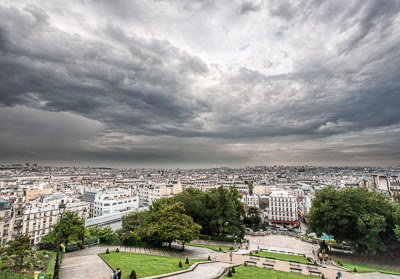 While we were outside the Sacré-Coeur, it began to rain. Along with many others, we took cover under the entrance way at the top of the steps of the great Church. It began to rain harder, so we all moved inside the entrance way a little more. Then the wind picked up. We moved inside a little more. Then both the rain and the wind intensified. We soon realised we were in a storm. Hiding behind even one of the immense stone pillars was useless in the face of such a deluge, and as the water descended upon us, screams of laughter and fear emanated from young American and Spanish girls as the wind enthusiastically whipped the heavy drops of rain into practically every nook and cranny of the entrance way. We tried to go inside the Church but the doors were sealed shut. People cried out for the doors to open, and they opened. We all piled in, wet, cold, and with smiles of relief and joy on our faces.